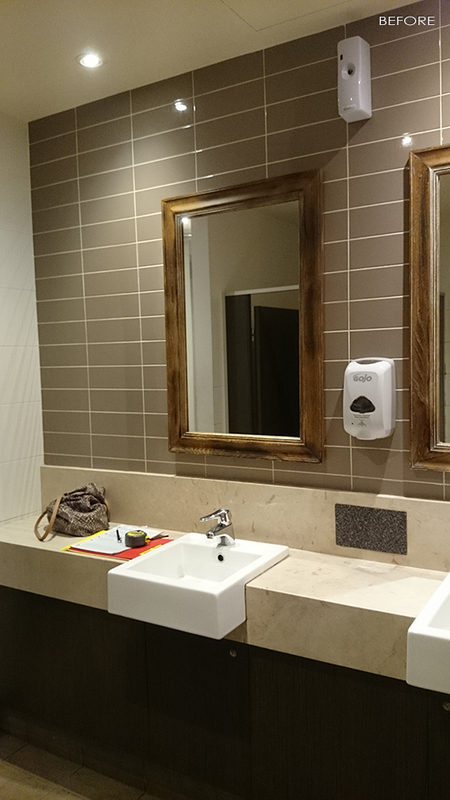 Birdblack Design were engaged by Dapto Leagues club to renovate a male bathroom due to a substantially unhygienic smell issue, as well as a tired face. 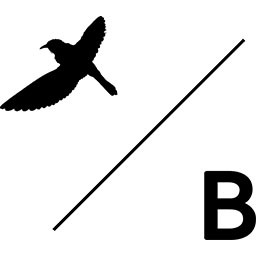 Seacliff Constructions were in charge of putting our beautiful design into place. 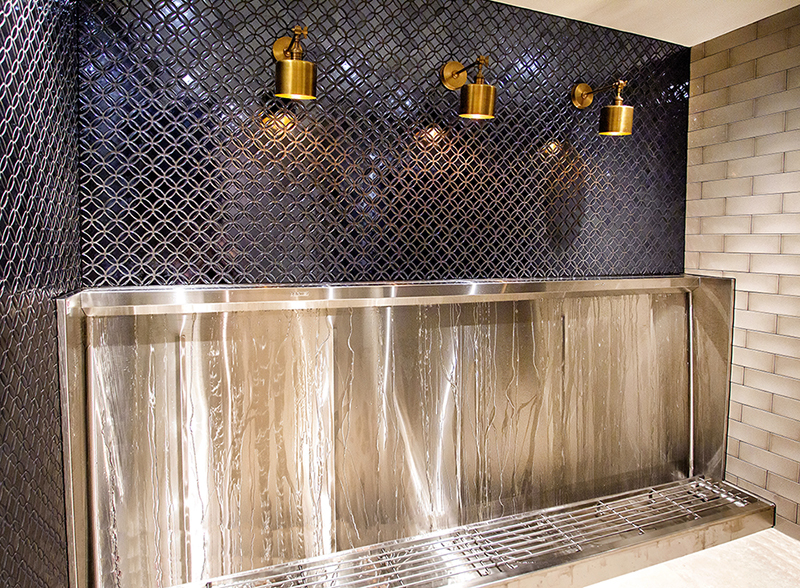 They were meticulous with their attention to detail as you can see evident in the project photos. 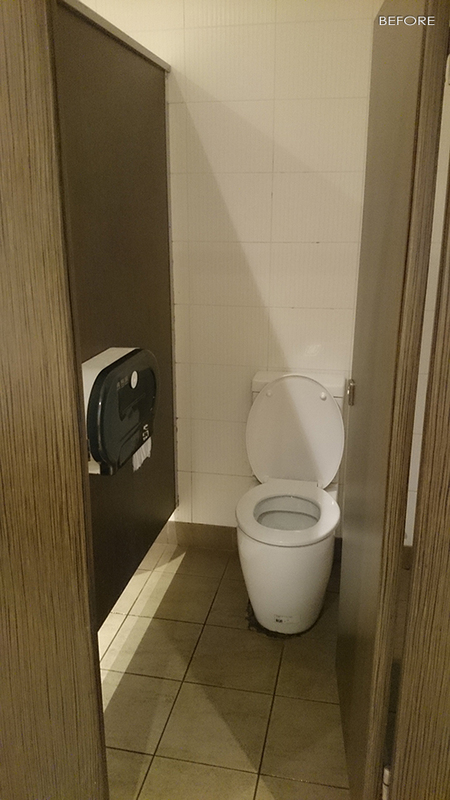 The original bathroom had two tiny single urinals, a toilet cubicle and double basin. 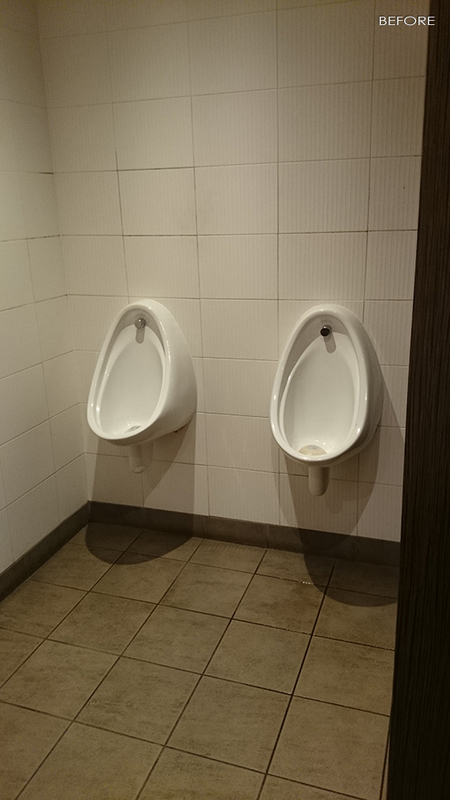 The urinals were the real cause for concern as it was an ongoing game of hit and miss resulting in an unsanitary space. 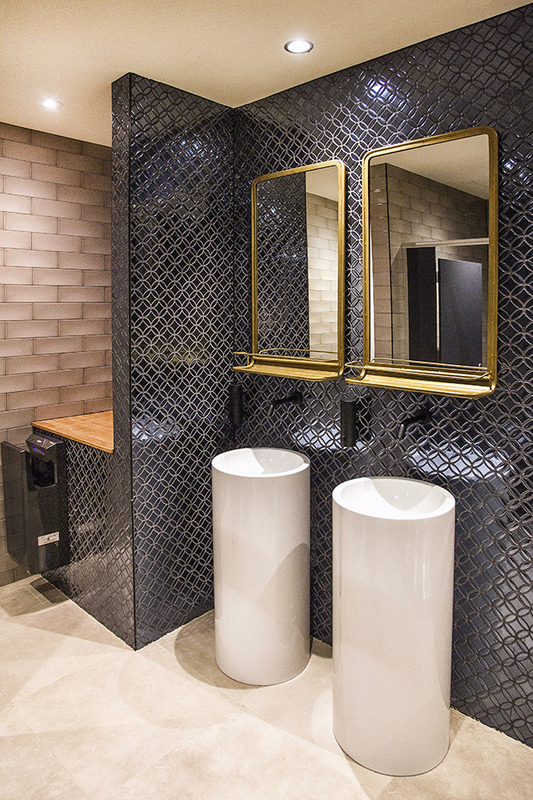 The leagues club had recently been renovated and radiated luxury, our brief was to create a much more efficient, hygienic space that exuded this same luxurious opulence. 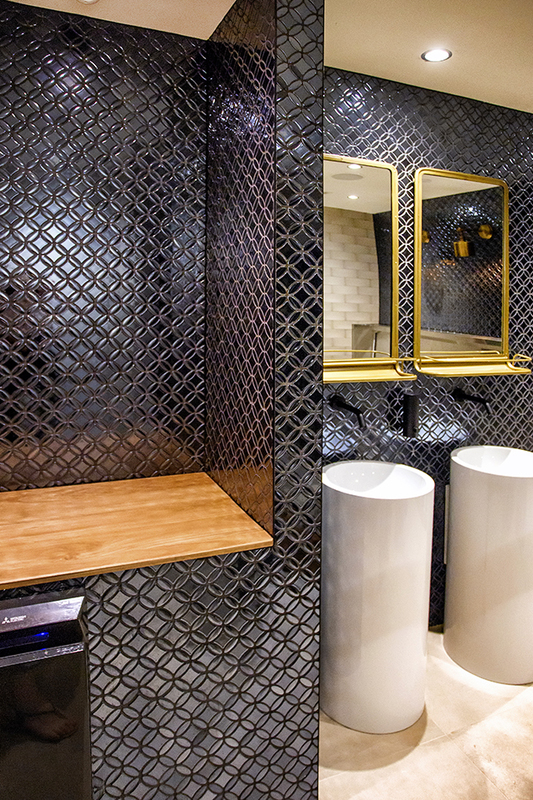 Irrelevant to this space being a male bathroom, we knew this was still a space that deserved special attention to complement the already elegant venue. 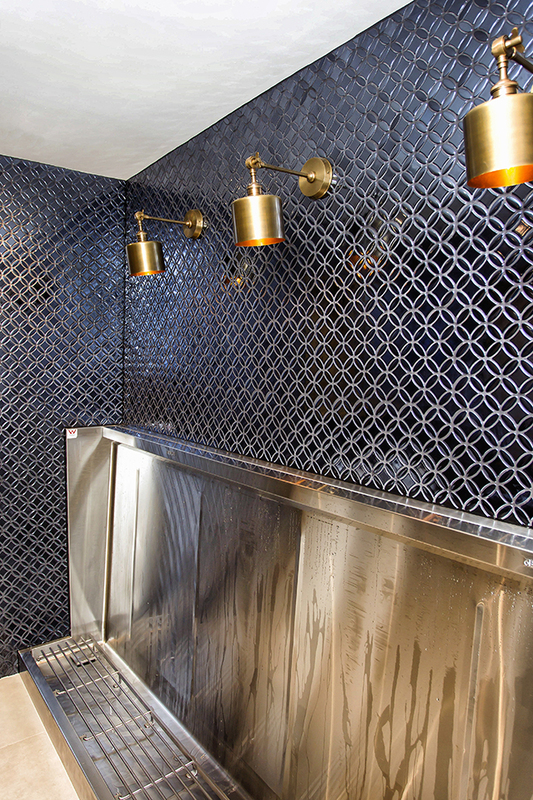 Navy glass mosaic tiles bring the room to life, embedding that glitz and glamour feel into the room with a reflective kaleidoscope effect. The space is then pulled back and complemented with an olive-grey subway wall tile and large format Italian porcelain floor tile. 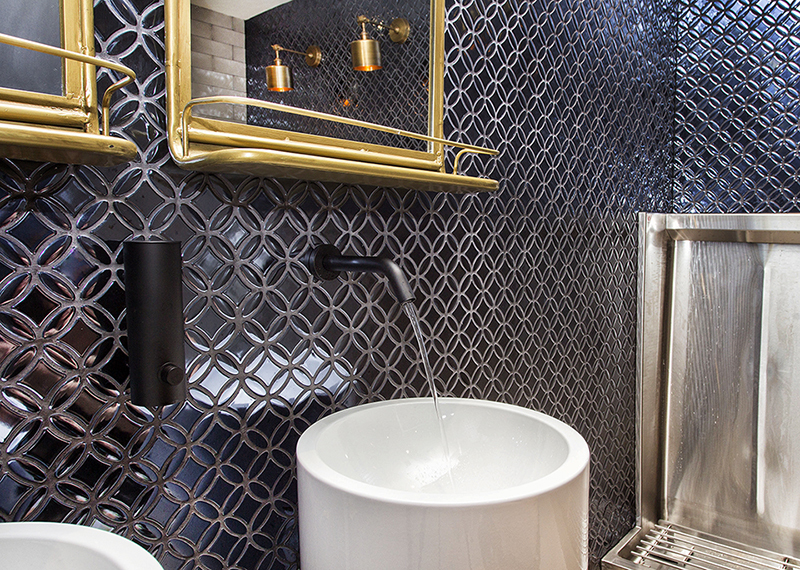 The black grout against the subway tiles creates a striking contrast. 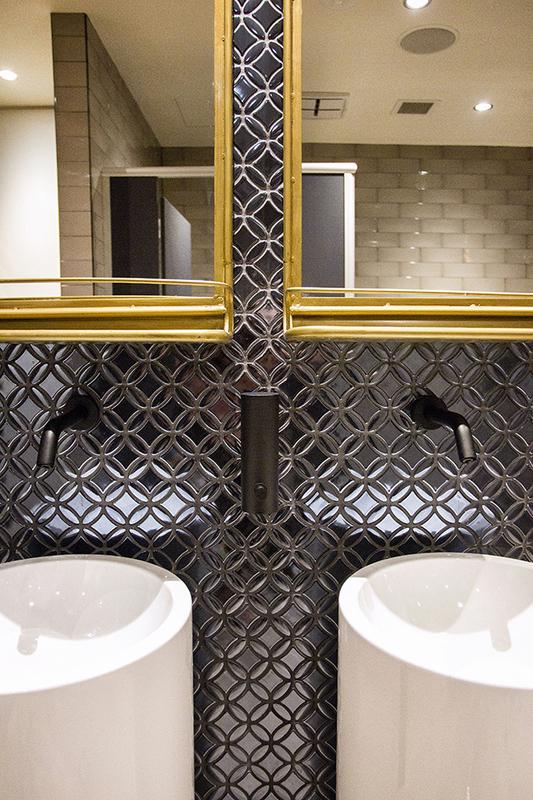 Additional warm tones have been incorporated into the space by carefully selecting bronze highlight pieces. 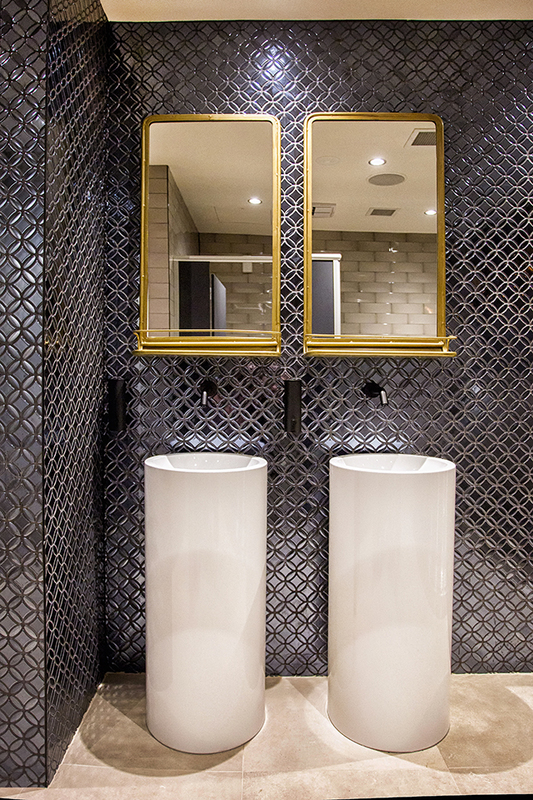 Seductive bronze framed mirrors sit above two feature pedestal basins. While large bronze wall mounted pendant lights protrude along the length of the space. 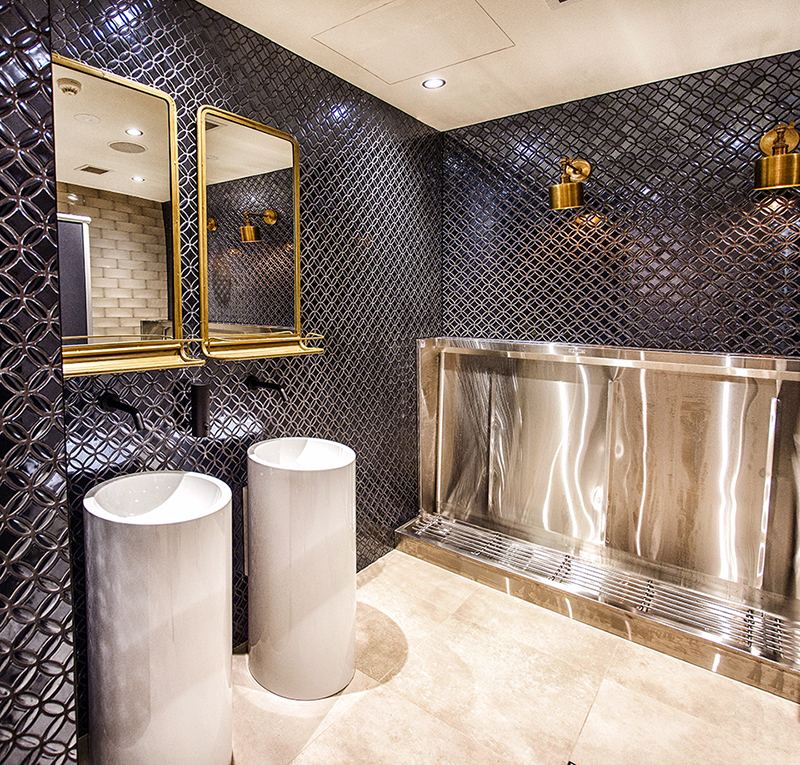 The lights emit warm light downwards, contrasting the cold steel of the wall to wall length urinal that leaves little room to miss. 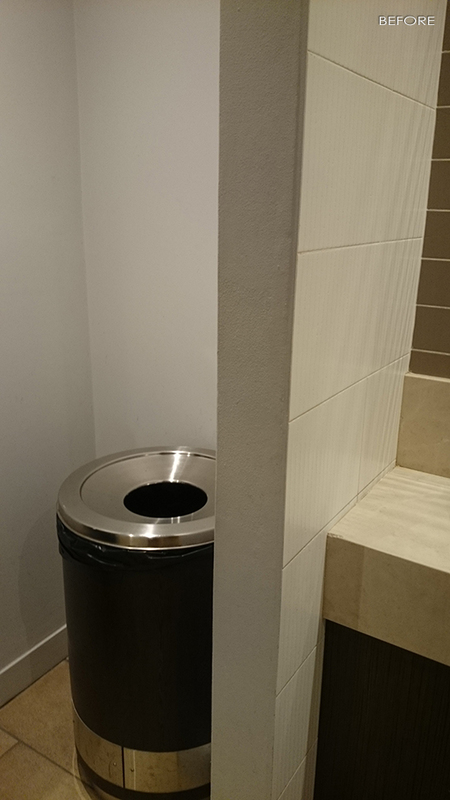 After ridding the bathroom of old, soiled materials, a huge new ventilation system was installed, three times the size of the last, creating a space much more easy to breathe in. 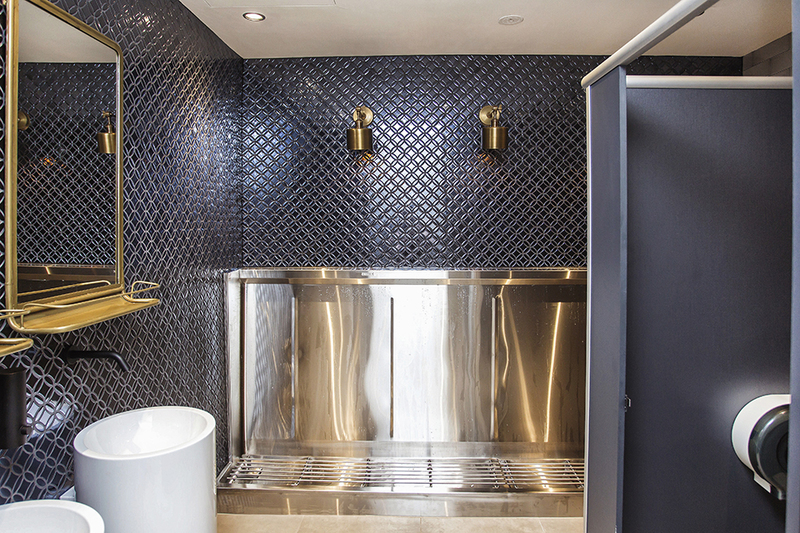 Other fittings and fixtures have been selected in complementary matt black finishes, designed to disappear into the charcoal tiles behind. 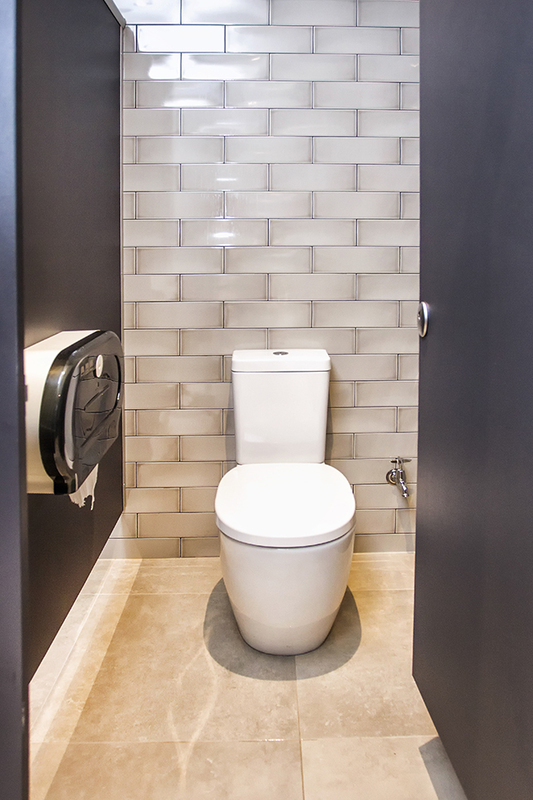 Each fitting has been selected with the intention of absolute luxury whilst still creating as hygienic a space as possible. 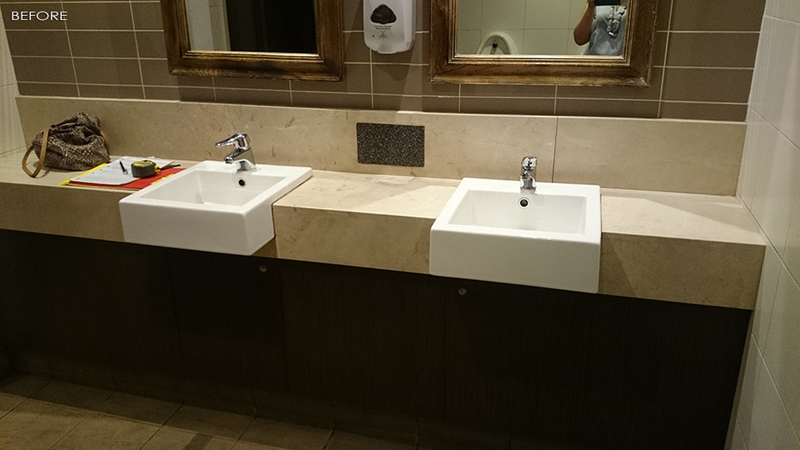 Wall mounted no-touch sensor basin spouts have been specified along with a dark automatic sensor Electric Jet Towel hand dryer. 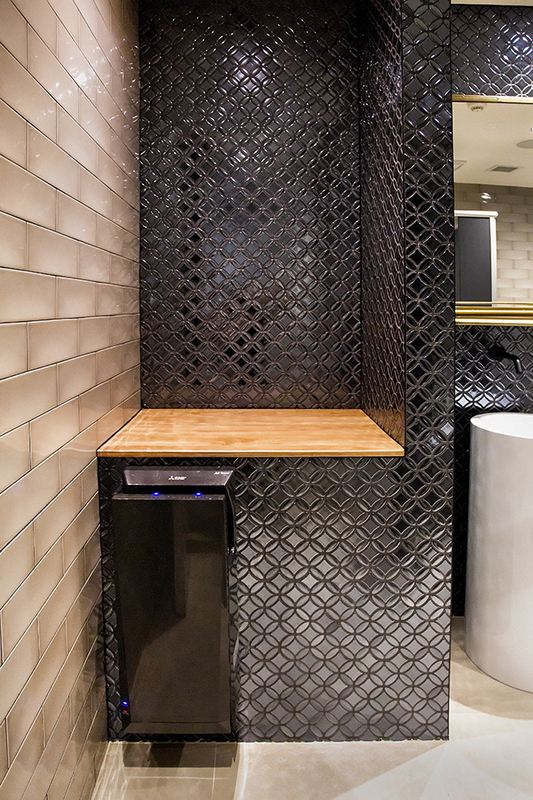 A charcoal, textured Laminate has been specified for the toilet partition to maintain that sense of luxury throughout the space. With the entry space being finished off with a beautiful featured timber bench top, this bathroom now radiates in warm opulence as a space both impacting and functional.